The Quick and the Dead is an interesting viewing experience if for no other reason than to see some good performances from a talented group of actors. The video and audio quality are excellent but can’t quite make up for the slow pace throughout. If you search for The Quick and the Dead on the popular pseudo encyclopedia website Wikipedia you will come up with four unique and different entries that span about 60 years. The first on the list is a Nazi-occupied Europe war film, the second a documentary about racing, The third a television movie and the last is 1995's Sam Raimi (Spider-Man) directed western starring Sharon Stone (Basic Instinct). As the most recent entry on that list, it is no surprise that the movie has been released on 4K UHD and Blu-ray. Each year in the western town of Redemption there is a gunfight. Slingers from all over come to win the cash prize and this year an unexpected contestant named simply "The Lady (Stone) enters. The contest is run by the corrupt Mayor John Herod (Gene Hackman; The Royal Tenenbaums) who rarely loses and quite frankly probably holds this event for two reasons - 1) to remind the people of Redemption what he is capable of and 2) to boost his own ego. Other noted entrants include The Kid (Leonardo DiCaprio; Titanic), who believes Herod is his father and Cort (Russell Crowe; Gladiator), Herod's former associate turned preacher who is dragged to town by Herod's henchmen and forced to fight. Part way through the contest Herod changes the rules to end "in death" and one by one we see contestants dropping like flies until there are four remaining. The Lady (whose real name is Ellen) challenges Herod but unfortunately, The kid beats her to it. She then watched in horror as Herod kills his own son (well maybe his son). Cort and Ellen are then forced to fight but she refuses to shoot him and upon threat of death for both of them by Herod Cort kills Ellen. The next day at dawn Cort and Herod square off but before they can shoot buildings start exploding and it is revealed that Ellen is still alive and set to exact revenge on Herod as we learn that she accidentally shot her father as a young girl while trying to free him from Herod. Of course, she kills Herod and leaves Cort to become the new Marshall in the town of Redemption. With a fantastic cast, The Quick and the Dead has a lot of potential. Stone plays Ellen as a tough as nails person but shows her soft underbelly sometimes too. Hackman is Satan himself in this role and he makes it easy for one to despise Herod as he doesn't seem to have any redeeming qualities. DiCaprio plays a cocky, self-assured just out of puberty guy who really only wants his father's (or likely father's) approval and Crowe is well cast as the preacher who is anti-violence despite (or maybe because of it) having been a former gunslinger. Unfortunately, the pacing is rather slow and instead of building tension for the final fight scene it seems to simple drag along like a tumbleweed rolling through the drought-ridden prairie. Raimi's eye is certainly apparent throughout as we get quick-cut close-ups in various scenes but even these moments can't make the film more than it is - a simple western that doesn't get to the ending all that fast. The 2160p video quality is excellent though and the details come across sharp and clear. The desert, though in the background, is still an active part of the film and can be seen well despite some graininess throughout. The Dolby Atmos audio is outstanding with no discernible noise. The gunshots and explosions are clean and with a surround sound system they can be felt as they shake the walls. The 4K combo pack comes with the 4K disc. regular Blu-ray disc and the digital download. Sadly it only offers two mediocre extras which are the theatrical trailer and all new deleted scenes. I wish there had been some cast and crew interviews for this feature but if there are any they weren't included in this combo pack. 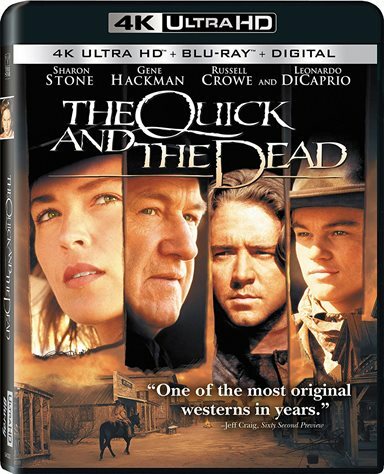 The Quick and the Dead is an interesting viewing experience if for no other reason than to see some good performances from a talented group of actors. The video and audio quality are excellent but can't quite make up for the slow pace throughout. Download The Quick and the Dead from the iTunes Store in Digial HD. For more information about The Quick and the Dead visit the FlickDirect Movie Database.